Thousands of people in Nigeria and abroad are marking the one-year anniversary since their leader Nnamdi Kanu was arrested in Lagos on 14 October 2015. Pro-Biafrans call for the independence of contested Biafran territories forcibly annexed to Nigeria during British colonisation. 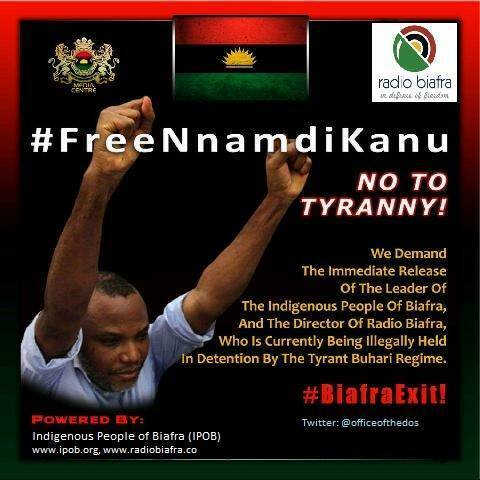 Kanu, leader of the Indigenous People of Biafra (Ipob) and director of UK-based Radio Biafra, is standing trial on six counts of treasonable felony charges. The Abuja High Court initially ruled in favour of granting bail to Kanu. However, in December 2015, President Muhammadu Buhari said the Ipob leader would not be released amid fears he could jump bail and flee to the UK, as he holds both a British and a Nigerian passport. Earlier this year, the judge presiding over Kanu's case stepped down. As the trial is now on hold, until a new judge is appointed, IBTimes UK looks at the case and its setbacks since December 2015. On 1 December, the trial is unexpectedly adjournedwhile Kanu's lawyers express fears for his client's safety. Kanu says he has no confidence in the court and alleges the government will not respect the outcome of the trial, which he deems as "needless". As a result, Justice Ahmed Mohammed steps down. The case is assigned to Tsoho. A hearing set for 18 January to discuss Kanu's bail application put forward by his lawyers is adjourned to 20 January as Tsoho is absent in court. Two days later, Tsoho rules Kanu should not longer be in DSS detention and orders he be sent to the Kuje prison. On 29 January, Tsoho denies bail to Kanu arguing he can leave the country. On 19 February, Tsoho rules against the possibility of conducting the trial secretly, as requested by the prosecution. On 7 March, one of Kanu's representatives, Chuks Muoma (SAN), says the prosecution is not ready to corroborate the charges against Kanu. He also asks for the charges against his clients to be dropped. Tsoho rules against Kanu's request to drop the charges and allows witnesses to testify behind protective screens. On 9 March, the defence opposes Tsoho's previous ruling that witnesses can testify behind screens. On 5 April, the trial is adjourned to 26 April after Chuks Muoma asks the court for a stay of proceedings pending an appeal his team has submitted against a previous court ruling. Kanu's defence argues against the decision of Justice John Tsoho to deny bail to their client. However, the Court of Appeal in Abuja upholds the high court's decision. Muoma claims a new lawyer has been introduced to represent Madubugwu. The trial is adjourned to 26 September to allow the new lawyer, Amobi Nzelo, to study the documents relating to the case. On 6 September, Judge Tsoho steps down and transfers the case back to the Chief Justice of the Abuja Federal High Court. The decision comes after Kanu and his legal team asked the National Judicial Council (NJC) to probe the judge over alleged "conflicting rulings". Kanu's defence claimed Tsoho initially ruled in favour of the defence's application against the prosecution's request to protect witnesses. He was then believed to have ruled in favour of the prosecution, without seeking the permission of a higher court. The Premium Times website reports Tshoho claimed he would not continue to preside over the case even if the NJC cleared him of any bias. The trial on Kanu's continued detention is adjourned to 8 November. Ecowas postpones the caseafter the Nigerian government and its legal representatives fail to appear in court on 6 October.